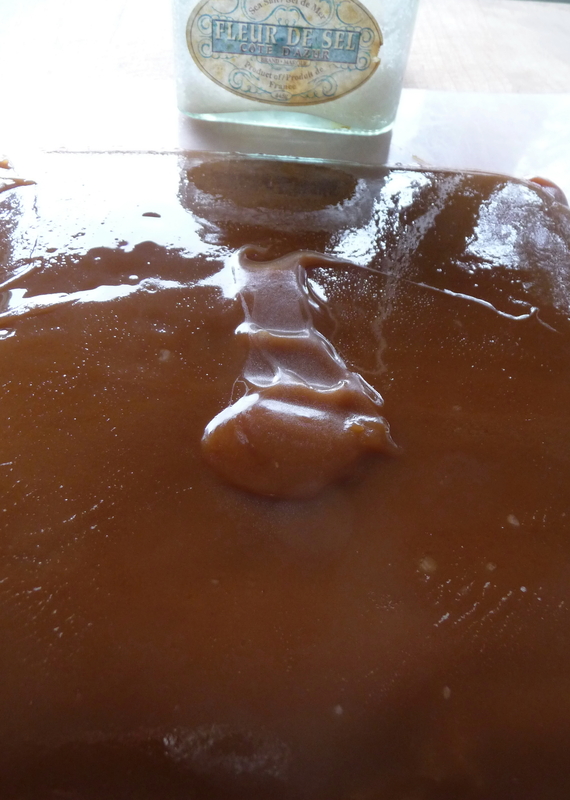 The original recipe was for the caramels alone, and it is worth making, unadorned. But I wanted to go a couple of steps further, adding pecans and coating in dark chocolate. Thinking of “turtles” (and I am sure the name of this candy is copyrighted, so I will await the lawsuit…), I realized that the caramels would be even better with the nutty chewiness of the pecans and the dark luxury of bittersweet chocolate. 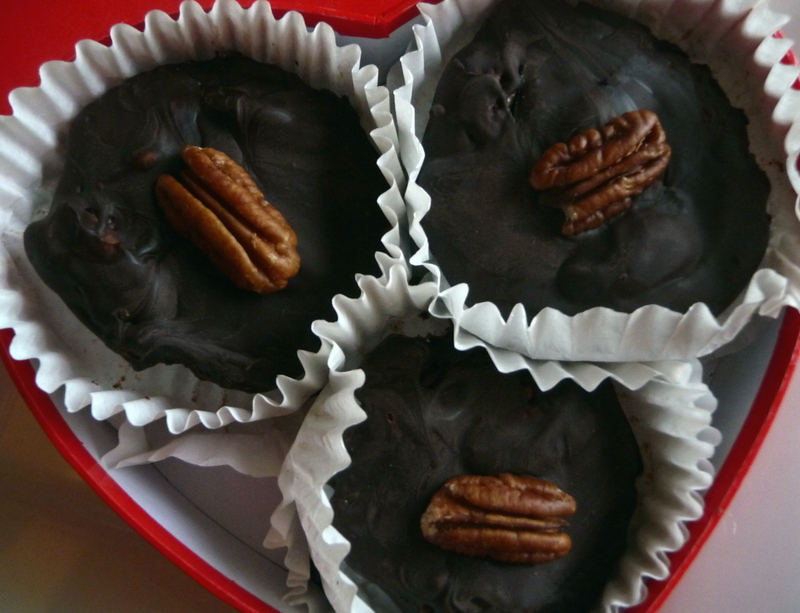 I was correct in my “turtle” instincts, and here is a recipe suitable for National Chocolate-Covered Anything Day, the holiday season, or any day requiring a special treat. Caramels au fleur de sel, or Salted Caramels, Adapted from Lucy Waverman, who adapted it from a recipe by Jacques Pepin. 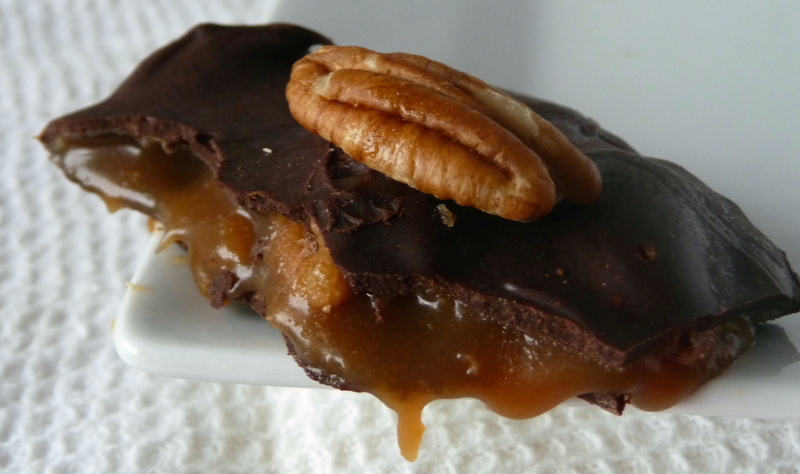 Makes about 18 salted caramels, or about nine chocolate-covered “turtles” see below. Cut parchment paper to fit the base of an oiled loaf pan. Cut a second sheet of parchment paper and place crosswise, across the pan, allowing the ends to drape over the sides to help you lift out the caramel. Place butter, cream and fleur de sel in a heavy pot over medium heat and, while stirring now-and-then, cook together until butter is melted. Set aside. Combine the water, Golden Syrup or corn syrup, and sugar in a heavy pot over medium-high heat and bring to boil. Uncover and boil about 6 minutes or so, just until a candy thermometer reads 305 F.
Carefully stir in cream and butter mixture – the mixture will boil up very dramatically! Be careful. The temperature will drop. Bring back to a boil again until a candy thermometer reads 240 F, about 3 minutes longer or so. Pour mixture into prepared loaf pan but do not scrape any that is left behind in the pot (this you can eat to ensure quality control of the finished product…). Cool at room temperature for 2 hours, then refrigerate for 1 hour. Sprinkle with a little extra fleur de sel and wrap in waxed paper or cellophane, if desired. (Try to envision small “logs”, like Tootsie Rolls, and twist both ends of wrappers, accordingly for an old-fashioned look). Make nine two-inch patties out of caramels, which should look like small disks or hockey pucks. Place three pecans on top of each disk, parallel to each other, pressing in slightly but firmly. Place on a non-stick liner (e.g., Silpat), parchment paper, or wax paper on cookie sheet and refrigerate for ½ to 1 hour. Melt chocolate, either in microwave (50% power at 30 second intervals) or in a double-boiler. Cool slightly. Using two forks for support underneath one disc, submerge in chocolate. Working quickly with a small spoon, try to cover the top of the disc and smooth out the top. Place on lined cookie sheet (used above). Put one pecan half in centre of top and push gently into chocolate. When chocolate has hardened, place into muffin liners, if you like. Eat and celebrate whatever you like. This entry was posted in Candies, Dessert and tagged Candy, Caramel, Chocolate, Dessert, Pecan, Salted, Turtle. Bookmark the permalink. There are so many days for everything i can’t even keep up. You know in Sweden each day is dedicated to a name, we call it name day. But these turtles look amazing. I recently did salted caramel brownies and they were out of this world. But they were made from sugar from the start not corn syrup, i wondering what the difference makes. Any idea? Anyways, these things are just bite sizes and would be perfect as gift or just taking a small bite and not feeling quilty. Nice pictures too. Hi, Ewa. I bet there is no day named after chocolate-covered anything in Sweden, is there? However, I hope there is a day for the lingonberry. My guess about sugar v. corn syrup is that the latter gives more body to a stand-alone caramel candy, rather than a vein in brownies from pure caramelized sugar..just a guess. I’m all for this day, but then it reminds me of a career coach I once knew who had a “high 5 day” and it just seems a bit over board. Although truth be told I do not need much encouragement to celebrate anything chocolate. I love your recipe and really enjoy the salty sweet combo of this kind of chocolates. What a yummy sounding treat. Thank you, Louann, for the compliments. But I especially liked the “high-five” anecdote – too funny! Please just don’t tell me the coach was of the $300/hour sort with a line like that…. Those turtles look excellent! I bought some dark-chocolate-covered kettle corn this evening, before I’d had a chance to read your blog, and discover that it’s Chocolate-Covered Anything Day! Hi, Rachel. You obviously are cosmically attuned to national food holidays out in SoDak. Or maybe you’re a true food-psychic?!? Heavenly little turtles. They look fabulous Dan. Thanks, Mandy, I appreciate your visits. You might be interested to know that the cats like the salty caramel – butter, cream, and, of course, salt appeal to them, too! I have never heard of National Chocolate-Covered Anything Day. Being a chocoholic, chocolate covered anything is an almost everyday event. So really, no need for such a holiday in KM universe. I attempted making caramels a year ago. Candy making is no easy feat here in the tropics. It’s as challenging as whipping egg whites and whipping cream! That was a lesson learned the hard way considering that true dairy whipping cream costs a small fortune here. It hurt to dispose the failed batch. Hi, KM. Yes, I remember the difficulties of whipping cream in Vanuatu (where the cream itself wasn’t prohibitively expensive); fortunately, I learned by freezing the mini-food processor bowl and blade it could work…eventually…in stiff peaks. That was the first and last time for my attempting tiramisu there. At least it was a dish requiring a hot oven. I hope all is well with you in the Philippines these days. I think chocolate covered anything day is like a made up holiday in August: The chance to eat chocolate. Oh, and every day is a chance to eat gluten, these days! Thanks, Joy. Despite their commercial origins, these holidays do provide pause to reflect on a certain food or else simple justification to indulge, right? I was wondering about the gluten on your site…. I am so glad you made it with bittersweet chocolate. We can still be friends. This looks right up my alley. Soft salted caramel, dark, dark chocolate and pecans! How can you go wrong? And why one EARTH would anyone question celebrating Chocolate Covered Anything day?!!! Dan—I wonder about you sometimes. Hi, Geni. I know what you mean about those milk-chocolate-lovers (who don’t get the dark chocolate thing). My point is that there are certain things you might not want to cover in chocolate – think about it – really. And I don’t mean bacon or things like that, either…. How did I miss this?! I love ’em. I want ’em. I NEED ’em. I’ve never made caramel, but you make it look pretty easy. This is on the list (of stuff you’re making me :P)! Thanks, Jax. I shall have to teach you the not-so-secretive tricks to these addictive caramels. Maybe you are caught up in the snow and cold on your side o’ da Pond.